Cactaceae (Britton & Rose) 4: 36, fig. 33. 1923 (et: Orcutt Circular to Cactus Fanciers p.i. 1922). 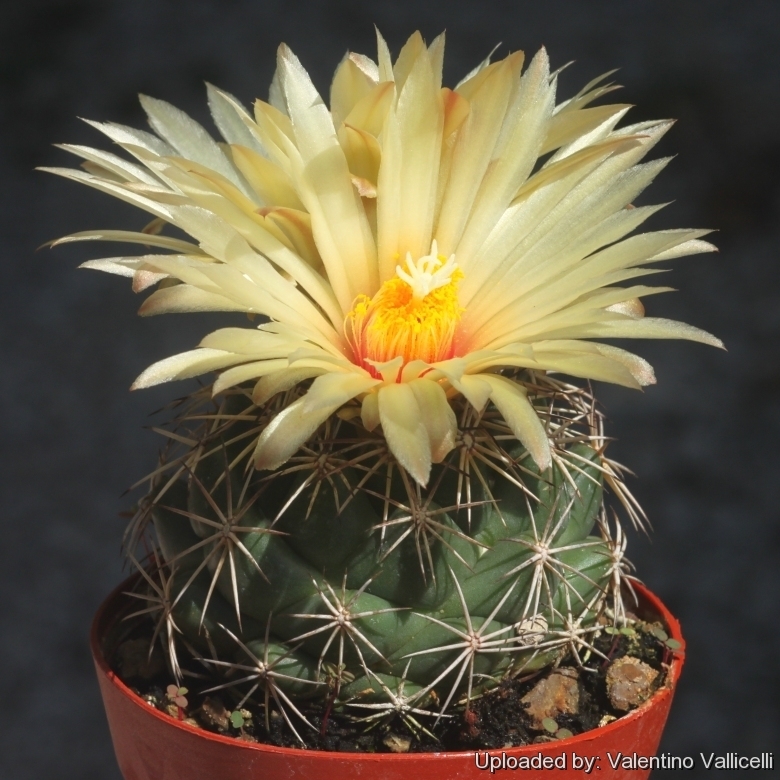 Description: Coryphantha palmeri var. pectinata is one of the many geographical forms of the extremely variable Coryphantha compacta. 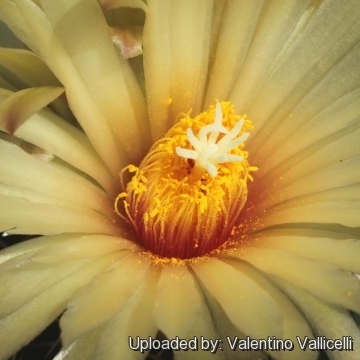 It distinguishs from Coryphantha palmeri for the absence of central spines and larger flowers, all the other characteristics are absolutely identical, namely size and form of tubercles, number, size and arrangement of radial spines, flowers, fruits and seeds. Stem: Globular small, somewhat depressed, pale grey-green to deep green, 4-5 cm high, 6-8 cm broad, but occasionally up to 10 cm tall and clustered especially in cultivation. Tubercles: Closely set in about 13 rows but not very regularly arranged, pale green, not very flaccid. Radial spines: 11 to 14, rather stout, horizontally radiating nearly at right angles to central one, yellowish with tips often blackish. Central spines: None, but occasionally after several years develop the central spines, giving the plant its sea urchin appearance. Flowers: Pale yellow to nearly white ﬂowers up to 5 cm diameter. Coryphantha compacta (Engelm.) Britton & Rose: It is a small, very variable solitary species often with only radial spines, but occasionally central appears. Distribution: Chihuahua, Tamaulipas, and Durango. Coryphantha palmeri Britton & Rose: Has usually one stout hooked central spines. Origin: Durango. 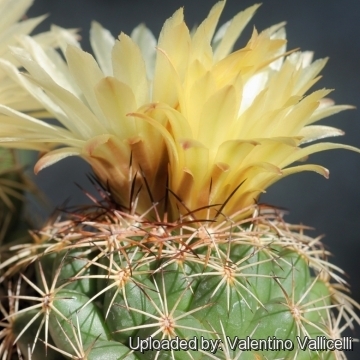 Coryphantha palmeri var. pectinata: has usually only radial spines and larger flowers. Cultivation and Propagation: In culture it is without problems, and regularly shows its large yellow flowers. It does best in slight shade, but does well in full sun too. It is sensitive to overwatering (rot prone), and needs a very porous soil with good drainage. It flowers quite early, but needs about 8-12 years to reach the typical, definite outlook. It tolerates fairly low temperatures as long as it is kept dry (hardy to -12° C for short periods of time).